The Williamstown and District Camera Club was launched in July 1965 following the demise of the Naval Dockyard Camera Club. The inaugural meeting was held at the Welsh Presbyterian Church Hall, Ferguson Street, where some 36 members "paid up". Not long afterwards the venue changed to the Methodist Church Hall, Pascoe Street, where the club met for a few years. This hall was old and the church did not have the finance to make necessary repairs. We were re-located to a newly renovated building in Electra Street, known as the "Coffee Shop" which proved to be a warm and cosy atmosphere for meetings. Funds played a big part in the camera club. Apart from member's subscriptions there was nothing to "work on". To acquire equipment and remain afloat, various fundraising activities were conducted. Snowball drives, lamington drives, collection of al-cans, sale of peanut brittle and chocolate started the ball rolling. Then came the auction of articles including home grown veggies etc. No doubt the home cupboards were raided to provide wares. Competition among members to gain the product was the source of some humour. A selection of spoons, badges, tie bars, tea caddy spoons, bottle openers bearing the club logo were sold adding a few more dollars. In more recent years the club has delivered the council publication Willy Wagtale to one ward (for a fee) thereby increasing the bank balance and bringing it a step closer to purchasing much needed equipment. Rental became too high therefore the club had to seek a new venue. This also meant a change from the first and third Thursday to the second and fourth Tuesday. Luckily the change had no bearing on the membership. Community Outreach was an organistion set up by the education Department to use school buildings after normal hours. Many activities including art, philately, migrant classes to name a few were conducted in the building, as well as the camera club. Through our fundraising activities the club was able to purchase a projector, stand, screen, studio lights and tape recorder. Several members in the club, past and present have left their mark. The first was Robert Winduss who designed the club logo. Viv Coulson made a cabinet to house our crockery and Adam Lindsay constructed a light box. Fred Hollis manufactured stands for lights. In 1976 Marcia Wyatt hand painted the club logo on t-shirts. This idea was later updated with more professional equipment by Margaret Hughes. V.A.P.s instituted the idea of Melbourne clubs adopting country clubs and so a long association began with Sunbury Camera Club, now defunct. Williamstown hosted other clubs on outings to this historic city including Carnegie, Cheltenham, Preston, Ballarat YMCA, Camberwell, Woodend and Red Hill. Most clubs suffer a downturn in membership - Williamstown being no exception. Efforts to increase membership has meant articles in the paper, displays at libraries and art shows, leaflets in letterboxes, beginners courses, Williamstown Summer Festival. In 1981 a large polystyrene camera was manufactured in Neil and Gail Anderson's home. The camera was loaned to Camberwell camera Club for Camberfest in that same year. In 1974 a newsletter entitled "In focus" was introduced, keeping members informed on all activities plus items of an informative nature. Throughout the history of the club we have engaged in social competitions including SEC, Sunbury, Pentax, Footscray (now Western Suburbs), Altona and Werribee and a mini convention with Essendon. In 1985 Pentax, Footscray, Werribee and Altona combined with Williamstown each taking turns at hosting the event. Additionally Marks Camera Store and GMH Camera Club combined to host a competition with eight other clubs. V.A.P.S conducts a convention each year which includes an interclub competition. Williamstown won the Grade III J. Kelly Trophy in 1971, 1977, 1979, 1981. Victoria celebrated its 150th birthday in 1985. A photographic competition conducted by the club was an accredited item of the celebrations. Winners were awarded medallions with the official logo. In 1988 the club participated in the bi-centenary by producing a pictorial record of the City of Williamstown which was later presented to the Mayor. 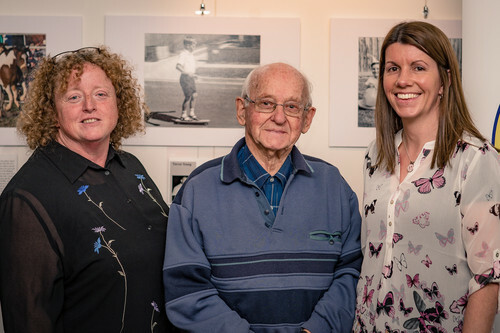 In 2015 our club celebrated our 50th year with an exhibition at the Williamstown Library. Members were invited to submit their favourite image, along with a portrait and an artist's statement. The opening was attended by the Hobsons Bay City Council Mayor Colleen Gates and was opened by our Founder Trevor Young. In addition to our exhibition our club went through a few other changes, our logo and branding was redesigned by member Arvin Coloma. Members were presented with four possible logos to choose from, the winner being chosen via a vote. Our new logo was the winner by a large margin. January 2017 saw another move for our club. We had outgrown the Walker Close Community Centre and needed more space, luckily Hobsons Bay had an availability at its Brooklyn Community Hall. We held a BBQ at our first meeting to celebrate our move.